If you're in a rush or you've got some last-minute guests coming for dinner then grilling hamburgers is an excellent option. What you really need in this case is something quick and easy and this recipe fits that bill perfectly. What makes it quick and easy but still very tasty? 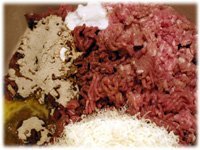 How about a hamburger seasoning recipe that includes French Onion Soup mix and Ranch Dressing? 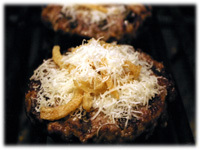 The picture above shows one of the hamburger patties hot off the grill and topped with shredded Parmesan cheese and French's brand french-fried onions. 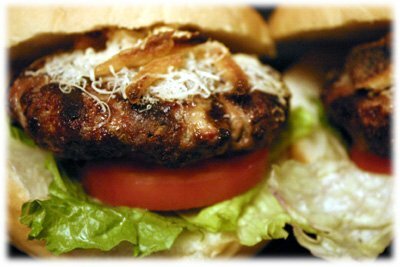 What really keeps these burgers nice and juicy is the Ranch dressing and the ground pork or sausage you add to the ground beef. And don't think you only have to make these tasty patties when your in a rush, they're great anytime. Tip: use French's brand french fried onions on top of the burgers just before they come off the grill. 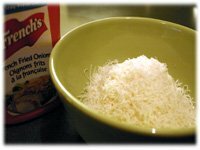 Grate your second 1/2 cup of Parmesan and have it ready to top the patties when you flip them on the grill, then top with the french fried onions. Add the first 7 ingredients of this hamburger patties recipe to a large bowl and mix well with wet hands to combine. Place about 1/2 cup of the meat mixture in your hands (wet hands with water first) and gently form hamburger patties about 3/4" thick. With your thumb make a small indent in the center of each patty, this helps counter the puffing up effect hamburger patties have while grilling. 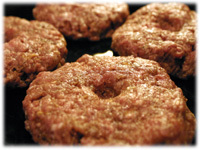 Place the patties in the refrigerator for an hour before grilling. 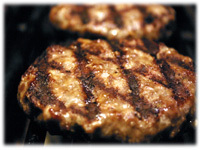 Grilling cold patties helps prevent the fat from rendering too quickly over the heat and losing moisture. Clean and oil the grates of the barbeque well and preheat to between 500F and 525F. 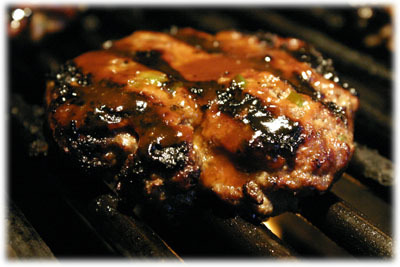 When the grill reaches this temperature take the hamburger patties from the refrigerator and place on the grill. 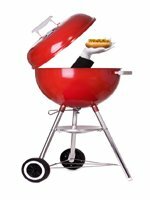 If you'd like the diamond shape grill marks then rotate each hamburger about 45 degrees after 2 or 3 minutes. After 5 minutes the burgers should be ready to flip - check underneath and if browning up with nice grate marks then go ahead and flip them. 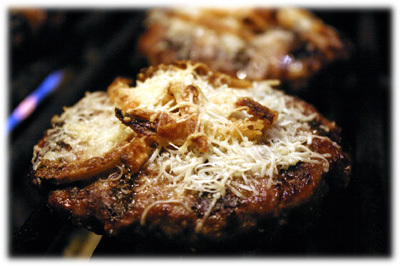 Put some of the grated Parmesan cheese on top of each flipped hamburger. 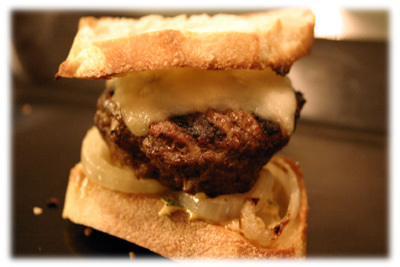 Place some of the French's fried onions on top of the cheese on each hamburger. Close the lid for another 5 minutes. Lift the lid, the cheese and onions should be browning and the burgers should be cooked. 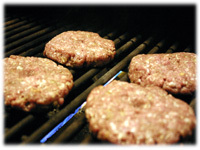 The internal temperature of the patties should be about 160F - 165F if you want to check. 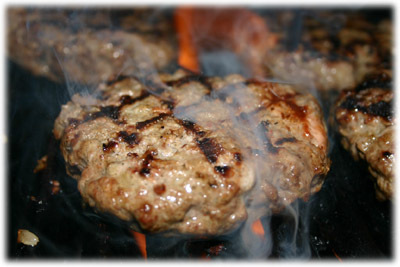 Remove the grilled burgers and tent some foil over them for 5 minutes before serving.